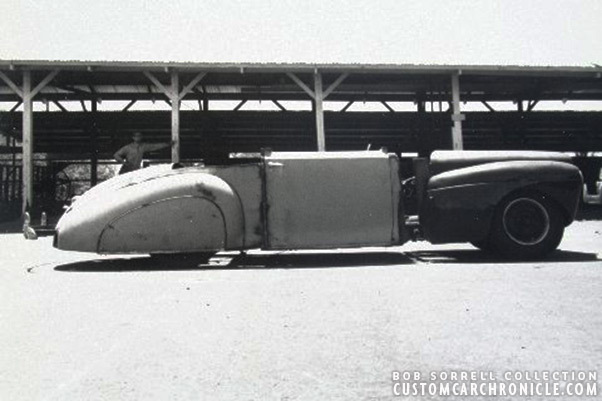 Around 1948 Bob Sorrell sets out to create an unique Custom Roadster using 1941 Mercury and 1940 Lincoln body parts. 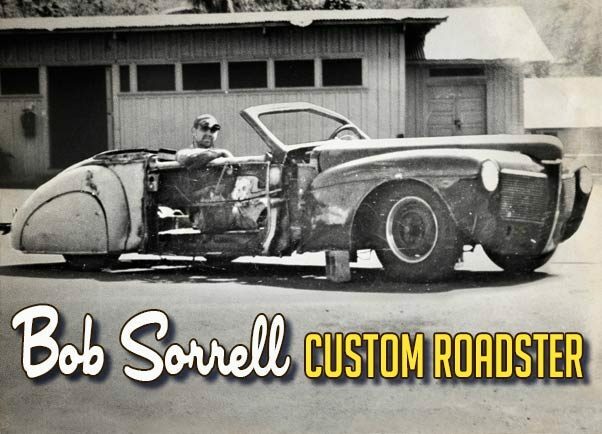 Bob Sorrel was a well known designer/engineer and craftsman who is best know for his Aluminum and Fiberglass Sports Cars, which were popular in the early and mid 1950’s. One of his cars graced the cover of the October 1955 issue of Car Craft Magazine. Bob Sorrell created beautiful design sketches from the ideas he came up with and was able to turn those designs into real cars using mechanical drawings and aluminum and fiberglass bodies with beautiful proportions. His famous SR-100 debuted at the 1953 Peterson Motorama Show, and was a huge success. 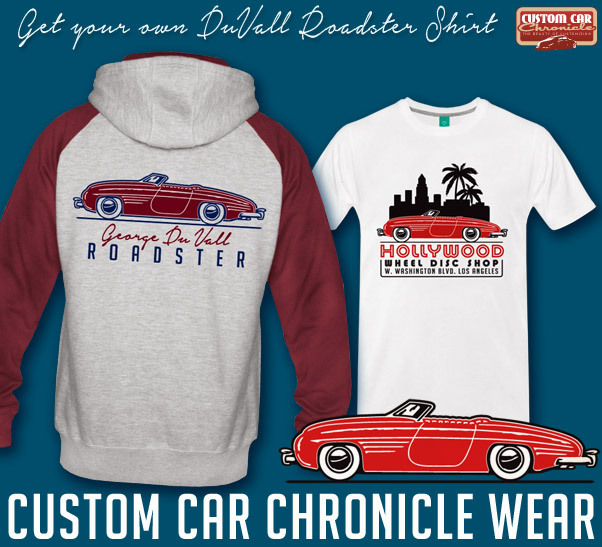 Years before that, in the later part of the 1940’s Bob Sorrell was creating cars using parts available from any junkyard in his shop on Felton Avenue in Inglewood, California. 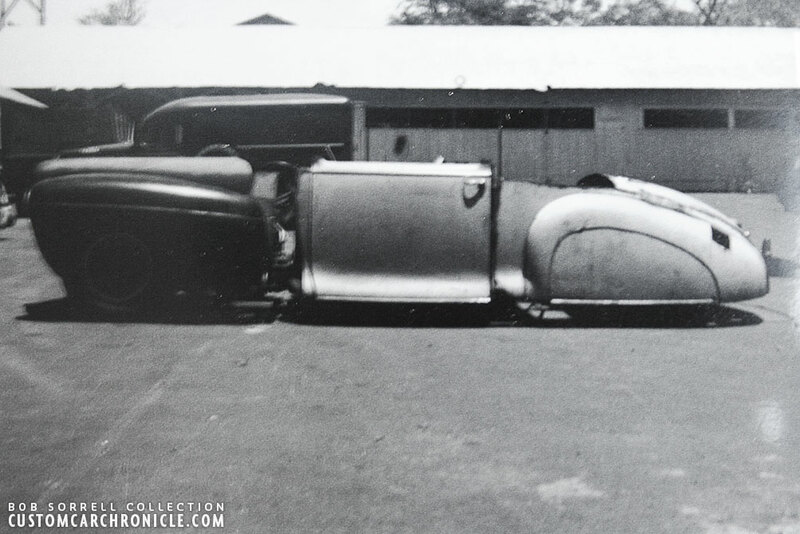 One of these cars is Bob’s mystery 1941 Mercury Custom Roadster. A number of years ago I first saw two photos of this car under construction. 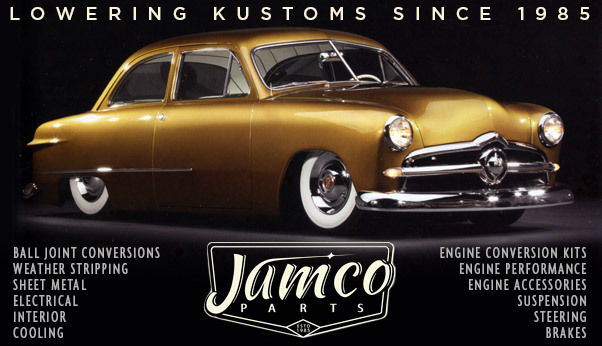 It was constructed of 1941 Mercury front fenders and heavily sectioned hood, and doors, rear fenders and trunk from an 1940? Lincoln. The car had really fantastic proportions, even though it was far from finished. My imagination worked fast and I saw this car finished as a beautiful Custom, white wall tires, single bar flipper hubcaps and perhaps a leaned back V-ed windshield with matching padded top. 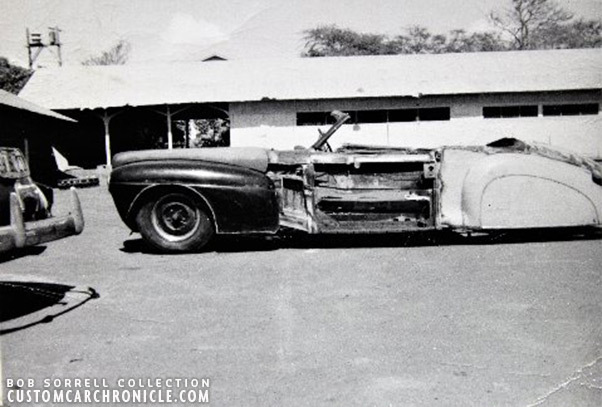 Since then I have been wondering what had ever become of this Custom Roadster, was it ever finished? Was it still around? 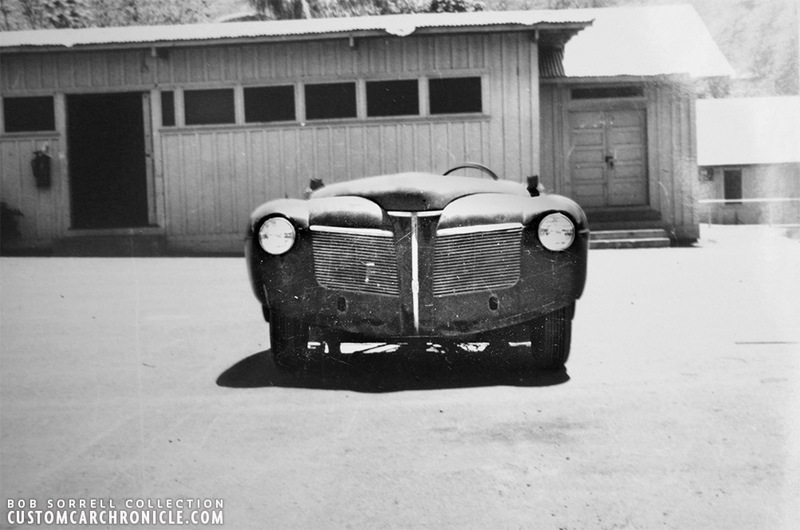 The first photo I saw of the Sorrell Custom Roadster. Not sure what frame was used for the car, 41 Merc, 40 Lincoln, or perhaps something completely unrelated with just these body parts added to it. The car looks to have a long wheelbase. 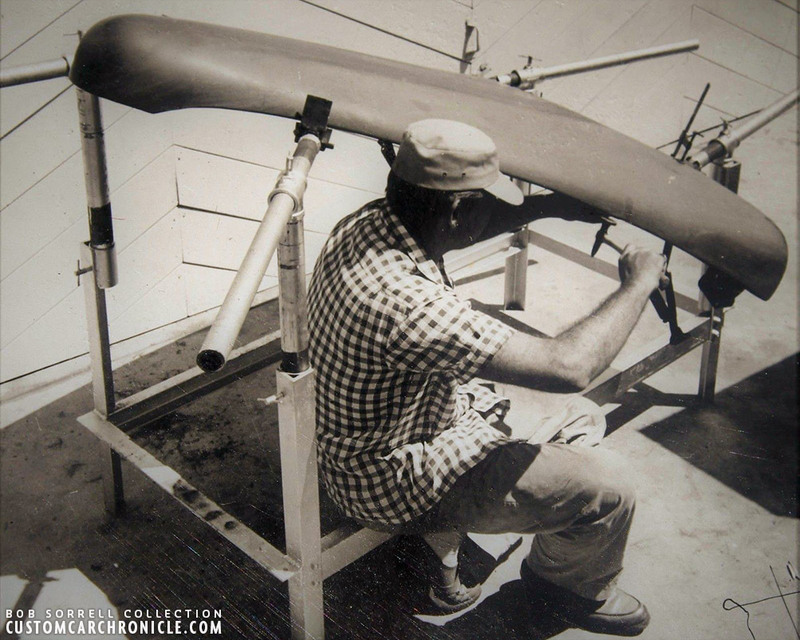 Notice that there is no cowl, nor windshield in this early stage photo. 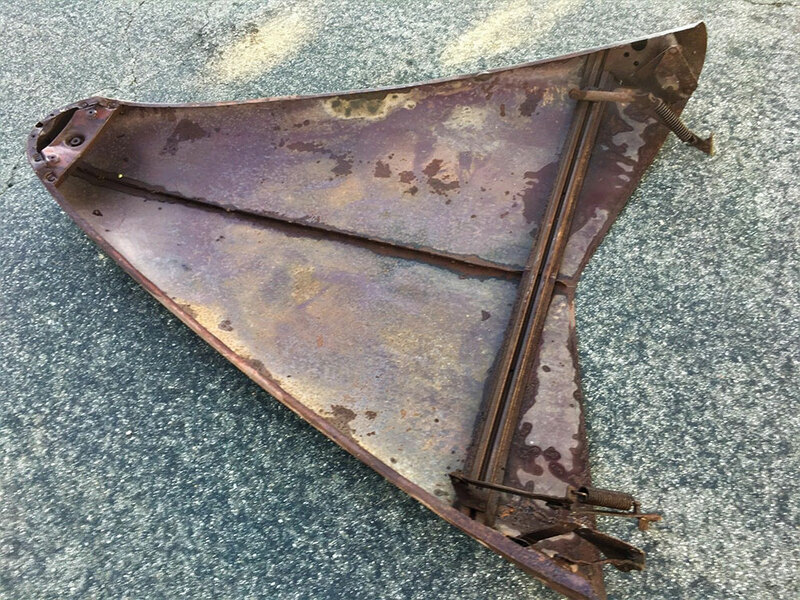 In the summer of 2017 a friend send me a link to an eBay auction of a sectioned 1941 Mercury hood. I recognized the photos in this ebay acution right away. This was the Sorrell Roadster that I had seen photos of years ago. And not one of the photos shows the builder Bob Sorrell sitting in the car with a much raked windshield attached, and it looked absolutely stunning. 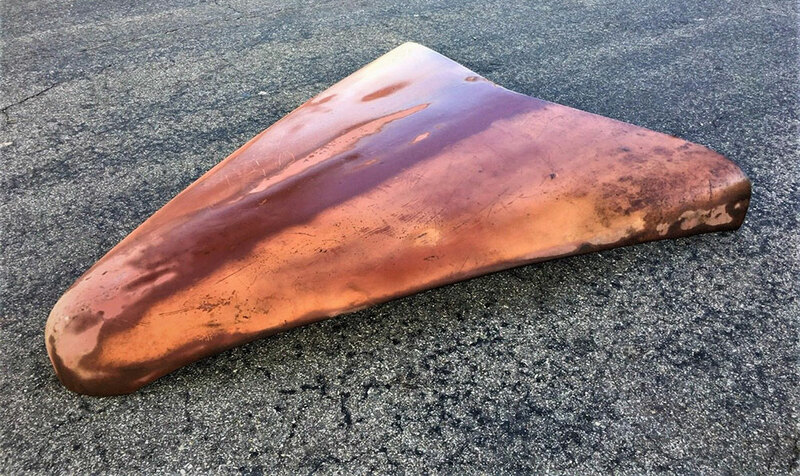 The ebay listing also answered another question, was the car still around… No, but the hood Bob Sorrell had sectioned in the 1940’s was. The hood as well as other material, including the photos come from the Sorrell estate. In the ebay ad there were several other photos I had never seen before. 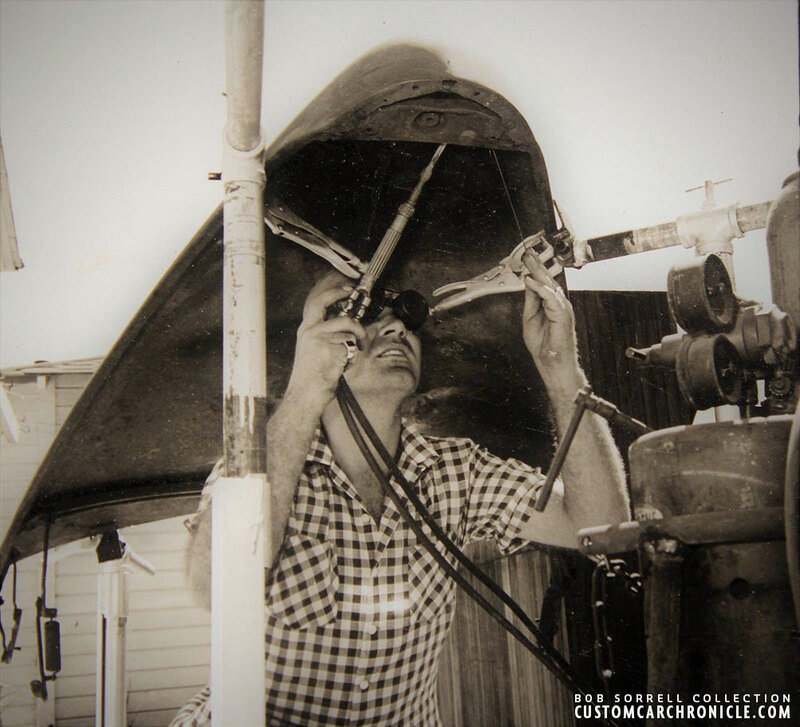 They show Bob Sorrell working on sectioning the hood of his Sports Roadster, or more likely acting like he was working on the hood for the camera. The sectioned hood was already primered by then. But still.. very interesting. The eBay ad mentioned a Car Craft issue, so I looked thru my collection of Car Craft Magazines and found the issue. 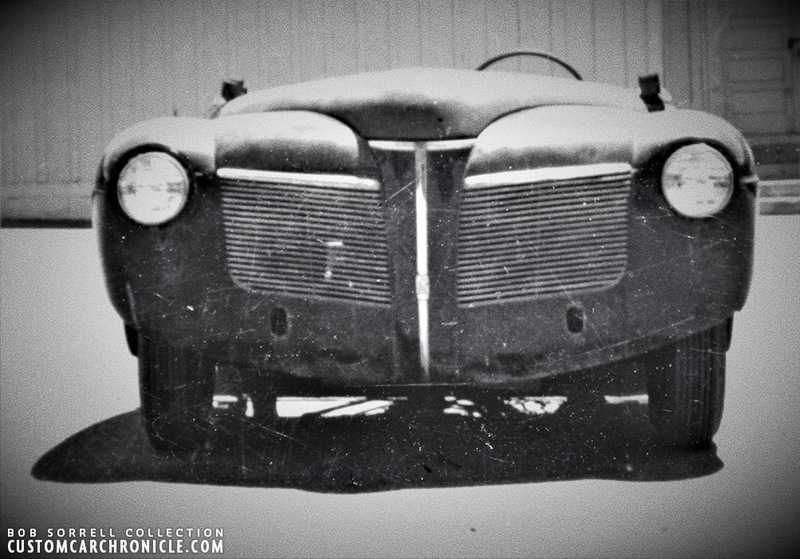 I had hoped that perhaps there where more photos of the 41 Mercury Roadster… but I guess I would have seen those before and would have remembered. 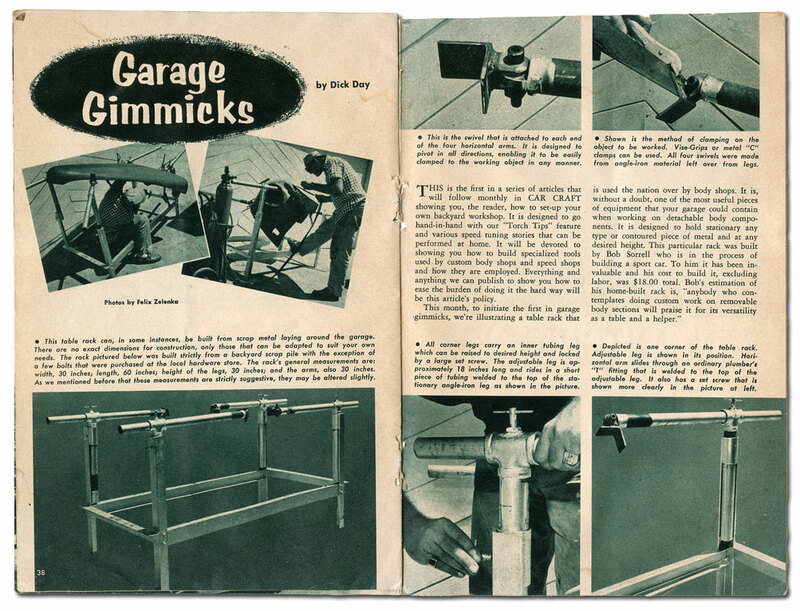 It was in fact an article on how Bob Sorrell had created this special tool that made working on car body parts a lot easier. Front view shows how much the hood was sectioned. Close up of the front shows that the sectioning of the hood was all finished and the hood was in primer. It makes me wonder if perhaps the front end might have been part of another project, and the Lincoln parts were added to it later? As far as we know the car was never finished. And all that is left of it is the finished sectioned hood. 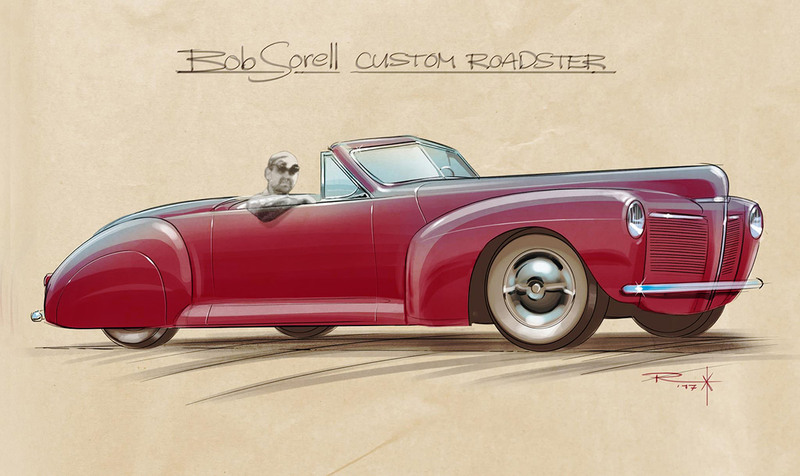 How cool would it be if somebody would use the hood, a very rare Bob Sorrell Original crafted item, and recreate the Custom Roadster Bob had in mind building in the 1940’s. And actually finish the car with the use of the original hood. The design is there, there are several photos that can be used as a perfect guide, and which still leave enough interpretation for tome personal touches. Parts from wrecked front and rear ends from the 41 Merc and ’40 Lincoln can be used. It would be an amazing project for sure. 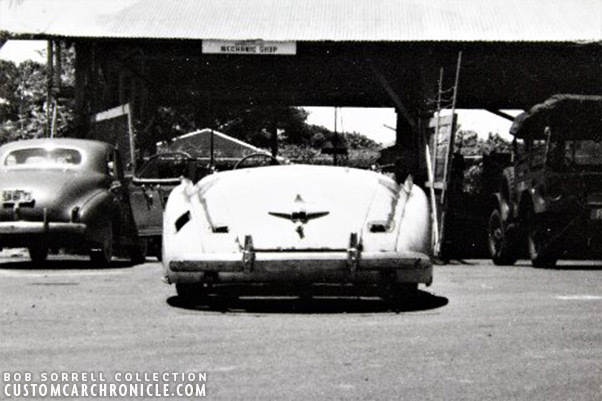 It appears that the photos of the car in progress were taken between 1947 and 1950, judging the license plates on some other cars we can see in the pictures. 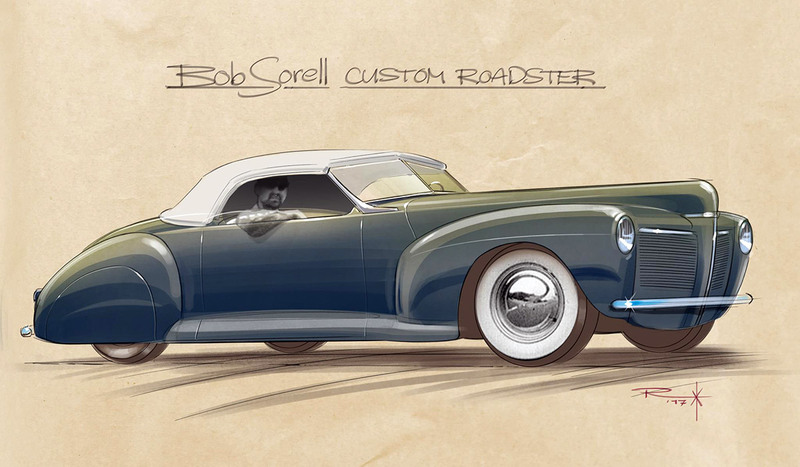 But we have not been able to find an exact date when Bob actually created his Custom Roadster. 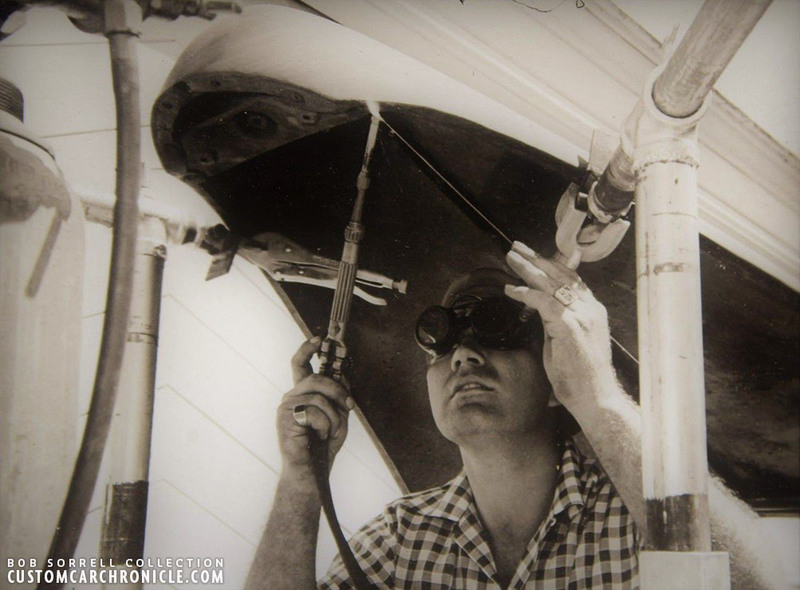 Most likely the photos of Bob acting like he is working on the hood were taken in the early to mid 1950’s. The current owner of the hood and photos send me a few extra snapshots of the Sorrell project for this article. Including this side view which shows that more work had been done, the now is a much raked windshield frame, the cowl has been started, and the front fender wheel openings have been raised. What a fantastic profile, remember that this is the late 1940’s. The other extra photo shows the rear of the car. And shows how the Lincoln rear panel was sectioned to flow with the rest of the car. The windshield was not yet added in this photo. The most spectacular photo of the project is this one. Showing Bob Sorrell sitting, day dreaming, in his Custom Roadster. The shape of the Custom Roadster is really amazing, and I really hope that somebody will be interested in recreating this car. It will be so great seeing this one finished. Notice how rough everything still is. The steering wheel in stock position sticks out of the leaned back windshield, the front fender is kept in place with an can, and Bob is sitting on the floor. Bob Sorrell demonstrating the special tool he constructed. They used the sectioned hood of his Custom Roadster to show how the tool works. Notice that the hood is all finished and in primer. “welding” underneath the hood made easy with the special Sorrell tool. The 1955 Car Craft magazine article featuring the special Sorell tool and also showing a photo of the sectioned 41 Mercury hood and the drivers side front fender. 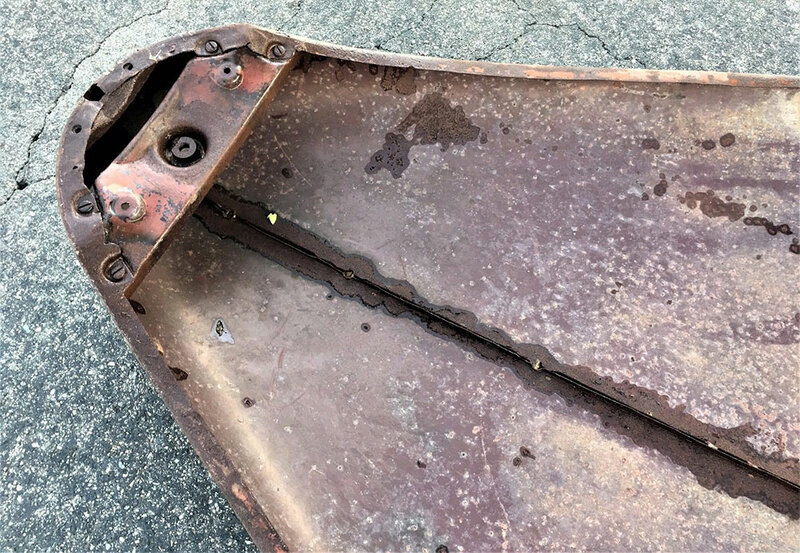 The actual hood that Bob Sorrell sectioned and welded solid in the 1940’s. The hood is together with the progress photos all that is left of the project. The hood is sectioned a lot. Underneath look shows Bob Sorrell’s craftsmanship. Perhaps a bit of Hoving magic dust needs to be sprinkled on that pic to fill in the gaps. Wow, those illustrations looks amazing. Thanks for bringing this unfinished masterpiece to light, Rik! It would’ve been an instant classic and today would be as much an icon as the Sam Barris or Hirohata Mercs if it Bob had finished it. Ruben’s drawings are wonderful!